but maple trees usually do drop their leaves PLUS about half of these leaves haven’t even changed colors! The first snow also lets you see who is around when you aren’t there! And who makes these star-like footprints? For the last few years, we have been lucky enough to hear and see sandhill cranes migrate through our neighborhood when we get our first blast of arctic cold. Going to see the sandhill cranes gather at the Jasper-Pulaski Fish and Wildlife Area is a great fall field trip! Here are some videos taken at Jasper-Pulaski. 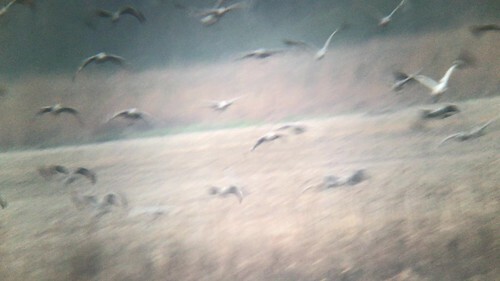 Scroll down for a video taken of a whooping crane flying with the sandhill cranes last Saturday. Another Hyde Parker shot this great video with the whooping crane in it! Nature walk- Meet October 30th at 9:30 am at golf range driving parking lot. If driving south on LSD, exit to the right at 63rd Street (Hayes) and take the first right turn into the parking lot. Drive through the parking lot until you get to the golf range building and park there. It is best time of year to catch a sunrise! This photo was taken at 63rd Street beach this morning. Arrive 15 minutes before sunrise on a partly cloudy day for your best shot at catching a very beautiful sunrise. This week, the last week before daylight savings time begins, you just have to arrive about 10 minutes after 7 am. Starting next Sunday you’ll have to get there about 10 minutes after 6 am. You’ll have another shot at relatively late sunrises around December 21 but the weather might not be as nice. Concerned about our local trees? Everyone is invited to attend a new tree lovers group. We will meet after the nature walk at 11 am Sunday October 30 in the Osaka Garden. You can get to the Osaka Garden by walking over the south bridge (parking lot at 63rd and Cornell). You will need to walk through wooded island to get to the garden. You can also park on Stony Island and then walk over the north bridge (Nancy Hays bridge) to get to the garden. These photos were all taken in Hyde Park (Chicago) during the last month or so. Next nature walk will be on Sunday October 30 at 9:30 am. I’ll send another email with the location of the walk nearer the date. Overheated or just swallowed an enormous fish? September 22– warm enough to do a little a sunning! Saturday September 3, Meet at 6:00 pm at golf range driving parking lot. If driving south on LSD, exit to the right at 63rd Street (Hayes) and take the first right turn into the parking lot. Drive through the parking lot until you get to the golf range building and park there. Juvenile goldfinches are now around the neighborhood begging from their mothers. First not-so-great video was taken at Burnham Park Sanctuary (47th and Cornell) with one fledgling resisting the idea that s/he should find food without being fed by a parent. Parent is in the top left hand corner in the video. You’ll notice the youngster is very quick to follow when s/he flies off. Second video, taken in AZ, has three fledglings begging from their mother. Soon the fledglings will learn to forge for themselves. Reminder: Nature walk and moon watch today! Goldenrods are blooming, fall is on the way! Nature walk- Meet at 6:15 pm at golf range driving parking lot. If driving south on LSD, exit to the right at 63rd Street (Hayes) and take the first right turn into the parking lot. Drive through the parking lot until you get to the golf range building and park there. Meet at the Fieldhouse on the Point at 7:45 for the 7:59 moonrise. The underpass to the Point is at 55th and LSD. There is also a parking lot there. Every year I try to get a great photo of goldfinches (wild canaries) on a bright yellow flower. Goldfinches breed late so they molt late so unlike other birds, they still look good this time of year. No good shots yet this year, so I am showing you my 2011 photos–really good, but best I’ve gotten so far. Four years of photos taken on the moon watch on the Point-next moon watch tomorrow night, meet at 7:45, moon rise at 7:59. See below for nature walk info. These moon rise photos were taken on our monthly moon watch/nature walks in Hyde Park (Chicago). Sometimes the moon comes up circular with smooth edges- it is often pink to red if it rises close to an hour after sunset. This happens on night after the full moon. I call it the 2nd full moon night. On the 2nd full moon night, the moon sets a while after sun rises so you can see it clearly if you are up before the sun lights up the sky and the sky is at least partially clear in the right places. Sometime the moon doesn’t appear to be circular and the edges don’t look smooth when it rises. This is called a moon mirage. The moon in the photo above changed into this moon. This is called an omega moon or an etruscan vase moon. See link to article explaining this below. Sometimes the explanations of this phenomenon appear to contradict each other but we Hyde Parkers are used to that. We’ve only seen this squashed moon once but the only reference I found on the web talked about an astronaut seeing a setting moon doing this in space. Squishy moonrise seen from space! All these photos were taken in the Hyde Park (Chicago) area during the past two weeks. In today’s blog. Moon watch — Thursday night, August 18th — meet at the lake near the Field House on the Point at 7:45 for an 7:59 moonrise. There is a parking lot and an underpass at 55th and Lake Shore Drive. east side of inner harbor: If driving south on LSD, exit on 63rd Street (Hayes) and park along the road or the in parking lot on the right hand side of the road. Walk south along the lagoon. Looking forward to visiting the Osaka Garden again– hope it is soon!! Should we start a petition? a member of pond damsel family– maybe a bluet? All photos were taken during the past two weeks in Chicago (Hyde Park). Nature walks- Tuesday, the 19th of July –9:30 am and 6 pm. Both walks will meet at the parking lot on the south side of the street near the intersection of 63rd (Hayes) and Lake Shore Drive. If you are driving south on Lake Shore Drive, turn right on Hayes (63rd) and then park on the road or turn right into the parking lot. Call if you can’t find us: 773 502-3159. Moon watch — Tuesday night, July 19th — meet at the lake near the Field House on the Point at 7:45 for an 8:02 moonrise. Wednesday night, July 20th– meet at the lake near the Field House at 8:30 for an 8:45 moonrise. There is a parking lot and an underpass at 55th and Lake Shore Drive. A Japanese beetle on Queen Anne’s lace: Queen Anne’s lace usually has a few burgundy flowers in the center. Lots of Japanese beetles around this year. They feed on 300 different plants but are especially fond of vines including grapes and Virginia creepers.